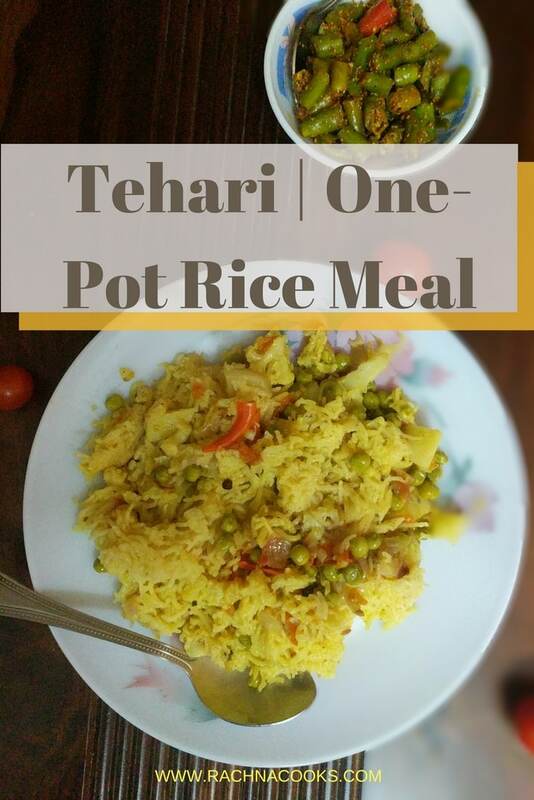 This is a comforting, homestyle one-pot meal made with rice, veggies and spices. Perfect for Sunday lunches when served with a side of veg raita. Heat oil/ghee in a pressure cooker. Add cumin seeds, bay leaves, cloves, pepper and cardamom and cook for a minute. Add the chopped onions and fry for a couple of minutes. Now add the ginger-garlic paste and slit green chillies and fry for a few minutes. Add tomatoes and cook till slightly mushy. Now add in the chopped veggies and fry in the masala for a couple of minutes. Add the rice along with water, salt and the spice powders. Cook for 2-3 whistles till rice is well-ccoked and not mushy and the veggies are cooked. You can use any veggies that you have at hand like carrots, knol khol etc. preferably the kind that do not turn too mushy. 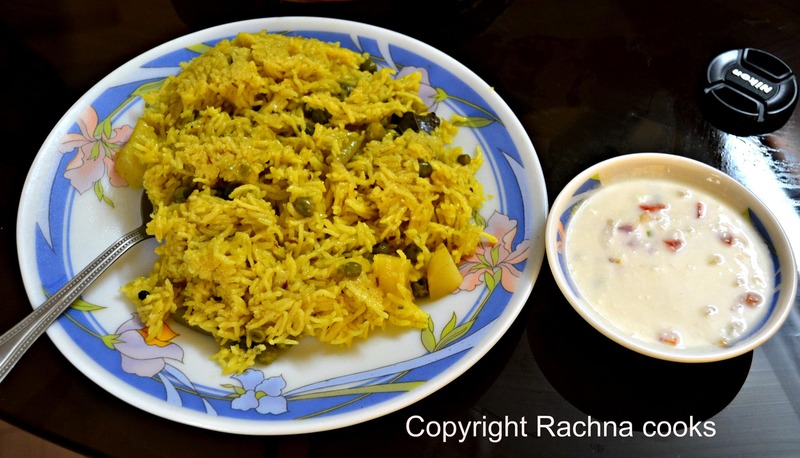 Basmati rice is the best rice to use for tehari. I normally use a pressure cooker to make my Tehari. It is faster and easier that way. You may, of course, use a thick-bottomed pan for the same. Heat the oil in the pressure cooker. Put in all the whole spices with cumin and fry for a minute. 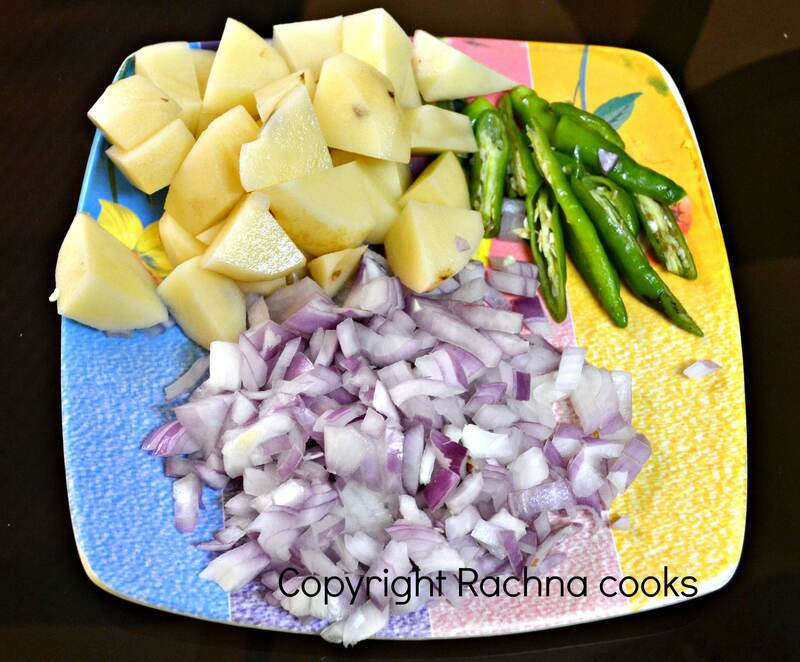 Add the chopped onions and fry for a couple of minutes till they are transparent. Add ginger-garlic paste and fry for another couple of minutes. Add in the slit green chillies and fry for one more minute. Add tomatoes and fry till mushy. Now tip in the cut veggies and fry lightly. You can add a little water if everything becomes too dry. Now add in the rice. Put in all the dry masalas along with salt. Add 2-3 cups of water and close the lid of the pressure cooker. It takes about 2-3 whistles to cook everything and for the slight burning at the bottom. Don’t keep it too long on the fire or you may end up with horribly burnt mess. Open the cooker and gently fluff up the rice. Serve hot garnished with chopped coriander. We normally serve veg tahari at home with a hot green chutney and some cool veg raita. A perfect Sunday afternoon lunch. This can be counted among Lucknow famous food. 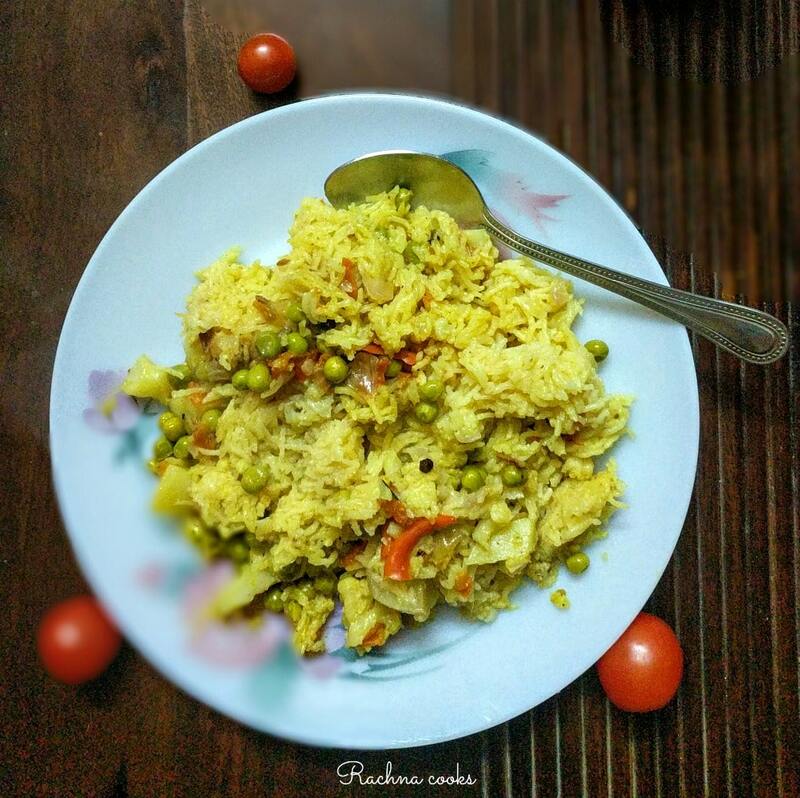 Do click and check other Uttar Pradesh food recipes on the blog. Let me know how it turns out :-). My mom used to cook it so well. It was after ages that I made it. G and the kids loved it. Simple bachpan ki yaadein! I hope you enjoy it. So good to see you here! I’ve always loved eating tehari UP style when a relative married to a UPite made it. Wonderful meal. Thanks for the recipe. I hope you enjoy making it. Thanks for reading! Will definitely try this ! Wow, so happy that you enjoyed it, Naba. I am bachelor.. live by myself and there are days when my maid doesn’t turn up. This was my first meal that I prepared by myself and amazingly it turned out to be amazing. Wow! I am so glad to know that, Nikhil. thanks for the simple recipe through which i cook for first time for my hubby. Thanks, Pooja. Hope you liked it. I am glad you liked this recipe, Aayaan. Of course, men can cook well. I see my husband excelling at cooking at home. 🙂 Welcome to my blog. Wow! I am impressed too, Anam. This is my comfort food!